Mangkhut will bring the threat for flooding rainfall and damaging winds from the Philippines and Taiwan to China late this week into early next week. 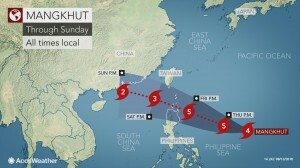 Mangkhut is known as Ompong in the Philippines. The strengthening cyclone passed by Guam on Monday evening, bringing peak wind gusts of 130 km/h (81 mph) on the island. Mangkhut reached super typhoon status Tuesday evening, local time, while churning in the Pacific Ocean. “Even further strengthening is expected with Mangkhut as it moves westward toward land,” said AccuWeather Senior Meteorologist Adam Douty. On Wednesday evening, Mangkhut became the equivalent of a Category 5 hurricane in the Atlantic and eastern Pacific. Should Mangkhut remain on its current track, the worst of the impacts will be felt across northern Luzon and the Batanes and Babuyan Islands in the Philippines. Residents in northern coastal and island villages in the Cagayan province of the Philippines will be evacuated on Thursday, the Associated Press reported. There is the potential for the powerful typhoon to make landfall on the northern tip of Luzon. Widespread wind damage and flooding is expected across these areas. Rainfall amounts of 150-250 mm (6-10 inches) are possible across northern Luzon, which would lead to life-threatening flooding and mudslides. If Mangkhut makes landfall, a significant storm surge will push onshore to the north and east of the centre of the storm. In southern and eastern Taiwan, this drenching rain will come following the tropical rainfall that Barijat brought to the island earlier this week. As Mangkhut pushes westward and emerges into the South China Sea, it may weaken slightly; however, it is expected to at the very least remain a powerful typhoon. “As Mangkhut crosses the South China Sea, widespread wind damage will be likely in southern China and around Hong Kong by late in the weekend, especially in coastal locations,” said Douty. Sustained wind speeds of over 160 km/h (100 mph), with even stronger gusts are likely along the coasts of Guangdong. Flooding in this area will also be widespread and extend farther inland in southeastern China into early next week. The mountains in southern China may slow, and ultimately weaken, Mangkhut as it moves inland. However, continuous rainfall for several days will elevate the risk for mudslides. Residents from the northern Philippines into Taiwan and southeastern China should continue to closely monitor the track of Mangkhut and make preparations.